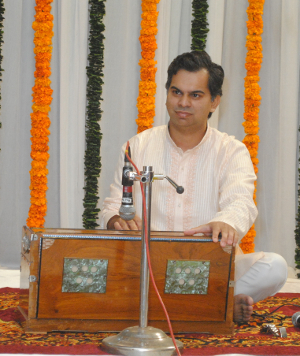 Kedar Naphade, an exponent of the art of harmonium solo and accompaniment. Kedar Naphade, a Hindustani Classical Instrumentalist, is one of today's leading exponents of the art of Harmonium Solo and Accompaniment. Kedar Naphade (born Jan 10, 1972) received preliminary training in Hindustani Classical Music from his grandfather, Shri Dadasaheb Naphade and from Shri Arvind Gajendragadkar. Since the age of 9, he has been a disciple of Late Pt. Tulsidas Borkar, arguably the greatest harmonium player of our times. Kedar has also had the privilege of training from Late Smt. Padmavati Shaligram-Gokhale, a veteran singer of the Atrauli-Jaipur gharana. She played a pivotal role in his musical development and sowed in him the seed that developed into a passionate love for the vocal art form. As such, like his guru Pt. Tulsidas Borkar, Kedar's music derives inspiration from the character of the traditional hindustani vocal art form, as well as the dexterous harmonium wizardry of Pt. Borkar and his guru P. Madhukar—a genius and pioneer in harmonium performance technique. In addition to classical music, Kedar also plays the semi-classical forms of Marathi Natyasangeet (Stage Music), Bhajans, Thumri, Dhun etc. Kedar has performed harmonium solo and has accompanied vocalists at numerous concerts in India, Europe and in the U.S. including prestigious festivals and venues such as the Alladiya Khan Smruti Samaroha, Dadar Matunga Cultural Center in Mumbai, The Lincoln Center in New York, The Smithsonian Institute in Washington D.C etc. He has also been featured on NPR. He has shared the stage with luminaries such as his guru Smt. Padmavati Shaligram-Gokhale, Pt. Jasraj, Smt. Veena Sahasrabuddhe, Pt. Ulhas Kashalkar, Smt. Prabha Atre, Smt. Laxmi Shankar, Pt. Phiroz Dastur, Smt. Ashwini Bhide, Smt. Arati Ankalikar, Smt. Kaushiki Chakraborty and others. Kedar continues to maintain an active concert schedule and teach the next generation fo harmonium players in the US and Canada.